I’ve already told you about the films this Saturday. Take your pick between The Chaser at 4:40 in Leicester Square and Seven Days in Brunswick Square at 6:30. How about making a whole day of it? Turn up at the Korean Cultural Centre earlier in the day and browse the DVD / CD library and watch your favourite soap / sample the singing talents of the shapliest K-popstrel in the audio-visual section downstairs. Stroll round the exhibition of Korean and English (and Korean-English) Vessels on the ground floor. Pop across the river to the Hayward Gallery to see Psycho Buildings. It’s not often you get to see a hip international Korean artist showing at a South Bank venue. Book in advance for your slot – it will be busy. It’s the last Saturday that it’ll be showing. We’ll allow you not to have a Korean lunch, though you could try Myung-ga in Kingly Street (just off Regent Street) if it’s open. Maybe you could also try the dim-sum place under the railway arches next to the Royal Festival Hall. Every now and then, during the course of the day, there will be screenings of a documentary about the remarkable Silla Dynasty “Sarira Casket of Kameun Temple” at the KCC (right). Impossible to replicate with modern technology, this 1300 year-old Sarira Casket remains a mystery of ancient craftsmanship. 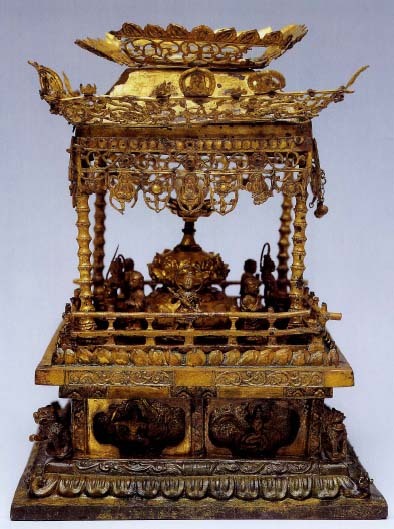 From the golden granules that are only 0.3 mm in diameter to the carvings of expressions on faces smaller than a rice-grain, this masterpiece of Buddhist metalwork houses many untold secrets. I suppose you could also have your photograph taken in a London phone box while you’re in the area (there’s one in Northumberland Avenue). But how about making this Saturday a Korean Day?